Part of this new filet-of-fish promotion is the "Double Filet-O-Fish sandwich," which looks a lot like they've just put 2 fish filets where there used to be 1! Does that really qualify as a 'special sandwich' that is "available for a limited time only?" 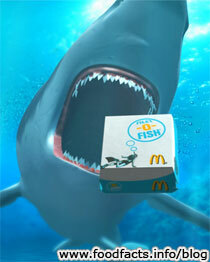 Couldn't you just ask for 2 filets on your filet-o-fish any time? The promotion is only running in limited markets (Atlanta, Detroit, Dallas/Fort Worth, Charlotte, Little Rock, Oklahoma City, San Antonio, TX and Sacramento, CA), through the Lenten season. I've had one of these double fish things, Ken, and you are exactly correct. The fish sandwich is okay, but not wonderful.